Batik is generally thought of as the most quintessentially Indonesian textile. Motifs of flowers, twinning plants, leaves buds, flowers, birds, butterflies, fish, insects and geometric forms are rich in symbolic association and variety; there are about three thousand recorded batik patterns. The patterns to be dyed into the the clothe are drawn with a canting, a wooden 'pen' fitted with a reservoir for hot, liquid wax. In batik workshops, circles of women sit working at clothes draped over frames, and periodically replenish their supply of wax by dipping their canting into a central vat. Some draw directly on the the cloth from memory; others wax over faint charcoal lines.This method of drawing patterns in wax on fine machine-woven cotton was practiced as a form of meditation by the female courtiers of Central Java; traditionally, batik tulis (tulis means 'write' in Indonesian) is produced by women.In the 19th century, the application of waxed patterns with a large copper stamp orcap saved the batik industry from competition with cheap printed European cloth. The semi-industrial nature of cap work allows it to be performed by men. Batik motifs recall characters from the Hindu epics, plants, animals, sea creatures and gamalan melodies. In Surakarta rich creams and browns are juxtaposed with tinges of yellowish gold.White, undyed cloth is left to contrast with the sombre opulence of brown and blue dyes in Yogjakarta. The palette of the north coast were influenced by lively maritime trade and the textile traditions of the Chinese and Arab mercantile communities living in port and coastal towns. Sido Mulyo :Sido (you should be ), mulyo (happy). Symbolizing 'you should be happy and rich man'. Sido Dadi :Symbolizing 'you should be a man/woman as you wish (prosperous, high ranking position, wealthy, etc)'. Satrio Wibowo :Symbolizing 'Man with dignity'. 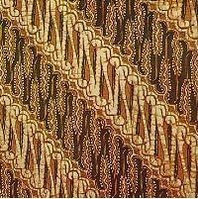 Tikel Asmorodono :Tikel (more), Asmoro (love), Dono (gift).It is meant the one who wears this batik, should be loved more and more by others. Batik, in Javanese means 'To Dot'. Basically there are two kinds of batik; Batik Tulis (hand drawn) and Batik Cap (stamped). The price of batik tulis is much more expensive than batik cap. A canting (a pen like instrument with a small reservoir of liquid wax) is applied to the cloth of batik tulis making. The tracing of the desired design on to the prepared cloth is the first stage of making followed by the technique of applying wax and dye substances. At the final stage of the process, all the wax scraped off and the cloth boiled to remove all traces of the wax. This process of repeatedly waxing and dyeing is the batik process, used until nowadays in Java and other parts of Indonesia. So, this kind art of batik is an indigenous to the country. The wax used in batik process is a combined product of paraffin, bees-wax, plant resins called gondorukem and mata kucing. Batik cap, which is also using the waxing process, its process of course faster and easier. But people appreciation of batik tulis is higher, it is really a work of an artist not only a craftsman. It combines the expertise, patience, deep feeling to produce the finest product, and it may take days, weeks and even months to make only a batik tulis.